Delivering the goods when it mattered the most, Rockstar Energy Husqvarna Factory Racing’s Pablo Quintanilla has earned victory at the opening round of the 2018 FIM Cross Country Rallies World Championship – the Abu Dhabi Desert Challenge in the United Arab Emirates. Powered by his Husqvarna FR 450 Rally machine the Chilean rally star ensured a positive first step towards successfully defending his Cross-Country Rallies World Championship title. Remaining focused on his well calculated plan of attack, Pablo put in the fifth best time on Thursday’s fifth and final stage. Retaining his lead in the overall classification, the Husqvarna rider wrapped up the 2018 Abu Dhabi Desert Challenge five minutes and 11 seconds ahead of his nearest rival. Racing through the heat, long stages and demanding off-piste sections of the Desert Challenge, in starting the new season in the best possible way, Pablo now looks ahead to what promises to be an exciting season of international rally competition. The Rockstar Energy Husqvarna Factory Racing rally team will be back in action at the 2018 Merzouga Rally on April 15/20. 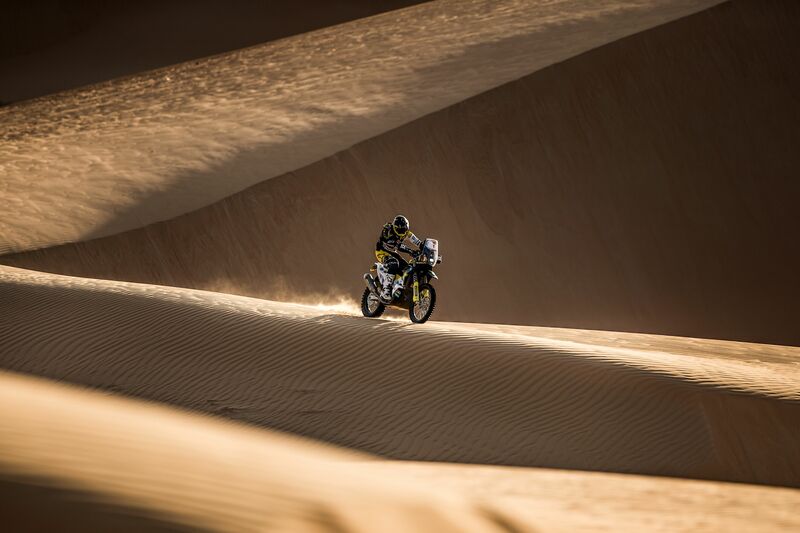 Following his winning result in the United Arab Emirates Quintanilla will be joined at the Merzouga Rally in Morocco by his Rockstar Energy Husqvarna Factory Racing team partner Andrew Short.